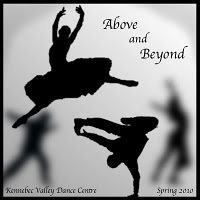 The 2010 Kennebec Dance Studio Spring Show entitled “Above and Beyond” was performed in the Winthrop Performing Arts Center. Both the noon and evening shows were filmed by talented Rambler Productions students. The two shows were then combined with the unique routines from each along with the better of the shared routines to create a top-notch product. Easy to use menus allow you to find the routine you are looking for with the star dancer you know and love!